Does your help desk resume need help? Showcase technical, diagnostic and customer service skills to generate interest. Get inspired with this sample. Does your IT help desk resume need some help? Showcase your technical, diagnostic and customer service skills to generate interest from employers, says resume expert Kim Isaacs. 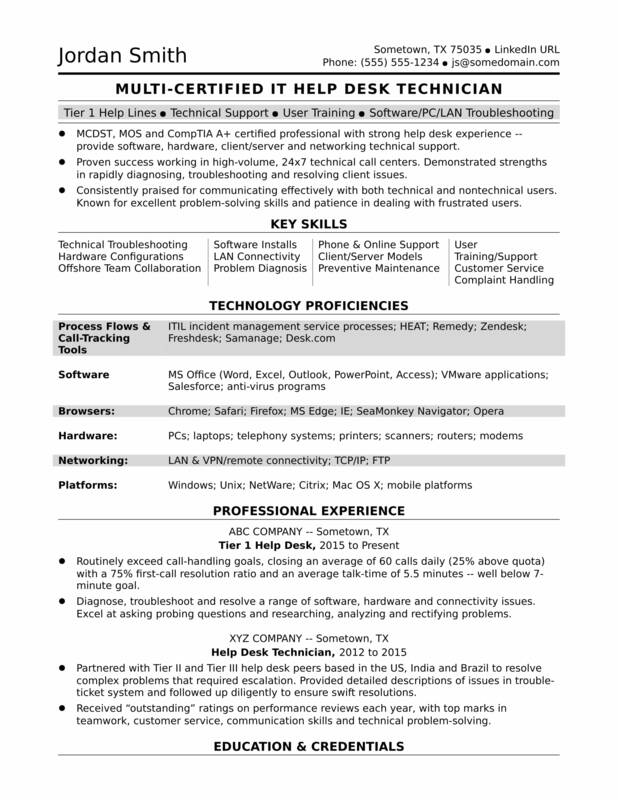 Get inspired with this sample resume for a midlevel help desk professional that Isaacs created below, and download the midlevel IT help desk professional resume template in Word. Jobs for IT help desk specialists are projected to grow by 11% (or 88,500 jobs) from 2016 through 2026, which is higher than average, according to the Bureau of Labor Statistics (BLS). You'll find the highest level of employment for this job in the following states: California, Texas, New York, Florida, and Illinois; and in the following metropolitan areas: New York City, Chicago, Dallas, Washington D.C., and Atlanta. As an IT help desk specialist, you can expect to earn a median wage of $52,810 per year, or $25.39 per hour, according to the BLS. Additionally, you can learn about technology careers on Monster. Proven success working in high-volume, 24x7 technical call centers. Demonstrated strengths in rapidly diagnosing, troubleshooting and resolving client issues. Consistently praised for communicating effectively with both technical and nontechnical users. Known for excellent problem-solving skills and patience in dealing with frustrated users. Routinely exceed call-handling goals, closing an average of 60 calls daily (25% above quota) with a 75% first-call resolution ratio and an average talk-time of 5.5 minutes -- well below 7-minute goal. Diagnose, troubleshoot and resolve a range of software, hardware and connectivity issues. Excel in asking probing questions and researching, analyzing and rectifying problems. Partnered with Tier II and Tier III help desk peers based in the US, India and Brazil to resolve complex problems that required escalation. Provided detailed descriptions of issues in trouble ticket system and followed up diligently to ensure swift resolutions. Received "outstanding" ratings on performance reviews each year, with top marks in teamwork, customer service, communication skills and technical problem-solving. People look to you for help when their systems aren't properly working, and when it comes to your job search, there are people you can reach out to for help too. Could your resume benefit from a QA assessment? Get a free resume evaluation today from the experts at Monster's Resume Writing Service. You'll get detailed feedback in two business days, including a review of your resume's appearance and content, and a prediction of a recruiter's first impression. It's a quick and easy way to upgrade your job search.